Dr. Sayanagi earned his B.S. in Liberal Arts with emphases in Physics and Applied Math from Juniata College in Huntingdon, PA, and M.S. and Ph.D. in Physics from the University of Arizona, in Tucson, AZ. Before arriving Hampton University, he held research positions at the University of Louisville in Louisville, KY, California Institute of Technology in Pasadena, CA, and the University of California Los Angeles in Los Angeles, CA. He has also served as a panelist on the 2009-2011 Planetary Decadal Survey by the National Research Council of the United States National Academies, and made recommendations to NASA and NSF on the planetary science research priorities in the 2013-2012 decadal period. 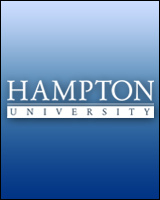 Dr. Sayanagi has taught the following courses at Hampton University. Research Interests: Dr. Sayanagi's research interests encompass a wide range of topics in planetary atmospheres. His research activities can be categorized into three rough areas. First, he studies atmospheric dynamic phenomena by numerically modeling atmospheric features such as jetstreams, vortices and waves. Second, he analyzes images returned from space probes to analyze clouds; in particular, he analyzes the images returned from NASA's Cassini spacecraft to study the motions and properties of clouds on Saturn. Third, he develops measurement methods and image processing techniques to improve and enable new analysis of images returned from space missions. Sayanagi, K.M., Dyudina, U.A., Ewald, S.P., Muro, G.D., and Ingersoll, A.P., 2014. “Cassini ISS Observation of Saturn's String of Pearls” Icarus, Vol 229, p.170-180. Sayanagi, K.M., and 8 co-authors, 2013. “Dynamics of Saturn's Great Storm of 2010-2011 from Cassini ISS and RPWS” Icarus, 223, p. 460-478. Sayanagi, K. M., Showman, A. P. and Dowling, T. E., 2008, “The emergence of multiple robust zonal jets from freely evolving, three-dimensional stratified geostrophic turbulence with applications to Jupiter.” Journal of Atmospheric Sciences. Vol. 65, Issue 12, p.3947–3962.